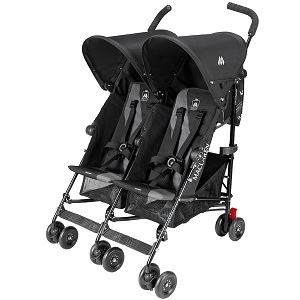 DescriptifLight double stroller for twins or close-aged children. Suitable for children from 6 months to 3 year old (15kgs max on each seat). This stroller is also available for long-term rental (above 1 month rental): please contact us for a quote. Light and narrow (76 cm only), the Maclaren Twin Triumph stroller will allow to enjoy your holidays in Paris with twins or close-aged kids. With its independant seats and reclining backrests, it will fit each child's needs: one may have a nap while the second one may enjoy the stroll. Able to go through standard doors, you'll be able to stroll through Paris shops and museums. Its small weight (less than 12kgs) will enable you to carry it if needed. As for all our products, baby'tems will deliver and pick up this double stroller directly to and from your place in Paris, appartment rental, hotel or relatives place. This stroller is newly referenced within our stroller rental range of products, thus customer comments are not yet available.